The project " Transforming Estonian Best Practice of Practical Entrepreneurship Studies to Ukrainian Universities“ aims to promote entrepreneurial thinking and entrepreneurship skills among Ukrainian students based on the best practices in Estonia. Together with Ukrainian partners from yep! UT IdeaLab designs business development programme yep!STARTER. It is an educational programme that provides practical skills and know-how for creating a business plan and founding a business. The semester-long programme includes workshops, mentorship and it begins with an inspirational event and ends with business ideas competition. 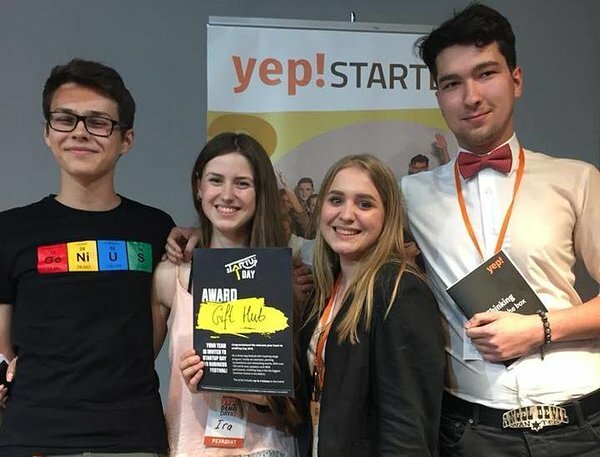 On 22nd of May 2018 Yep!STARTER business development programme students presented their semester-long work and competed for the opportunity to pitch at sTARTUp Day, a business festival in Tartu. The jury, which included, in addition to Ukrainian representatives, Maret Ahonen, UT IdeaLab Manager, and Sven Parkel, Managing Director of the Tartu Biotechnology Park, chose team GiftHub to be the winner. The winning team wants to simplify the purchase of gifts by using robot (bot) text messaging. Four members of the GiftHub team won a trip to Tartu and will have the opportunity to present their idea on IdeaLab’s pitching stage at sTARTUp Day. The finals of the students’ business ideas development programme Yep!Starter autumn 2018 took place on 17 December in Kyiv. The winner of the main award, tickets and trip to sTARTUp Day was Fonetify, whose browser extension helps to pronounce English text correctly. The outcome of the programme is increased understanding of how to start and run a business. It will also support the development of social skills that define employability of young people. The leading partners of the project in Estonia is UT IdeaLab and in Ukraine the Platform for Innovative Partnership (PIP), which, like UT IdeaLab, offers practical entrepreneurship education for the students. It unites four Ukrainian universities: the Kyiv National Economic University, Taras Schevchenko National University of Kyiv, National Aviation University and Donetsk National Technical University. The project is funded by the Ministry of Foreign Affairs development cooperation and humanitarian aid means.